Washington: The planet beyond the solar system that dark, even darker than a piece of coal, has been discovered by astronomers. The planet Jupiter is orbiting its star at a distance of about five million kilometers, and likely temperature 1,200 degrees Celsius. The planet is probably too hot to support reflective clouds as seen in the solar system, yet it still can not explain why the planet is so dark. This study will be published in the journal Monthly Notices of the Royal Astronomical Society. The planet, called TrES-2b is found in the Trans-Atlantic exoplanet survey in 2006. The distance from the earth about 750 light-years away in the constellation Draco. The planet is located in the Kepler space telescope sight which aim to find exoplanets using a highly sensitive light measurements. By using the data during the first four months of Kepler, David Kipping, a researcher at the Center for Astrophysics at Harvard University and Princeton University David Spiegel of assessing the amount of light emitted directly from the TrES-2b. They measure the amount of light from the "night side" the planet when directly in front of its star. Then compare with the light of the "dark side" before crossing the star. Differences were then measured to determine how much light is reflected or called albedo. In the solar system, Jupiter clouds reflecting the 52 percent, 37 percent of Earth reflects the light. 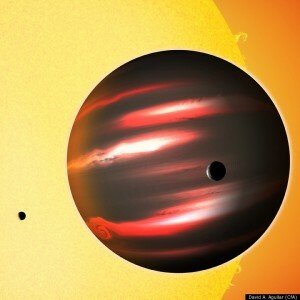 But it seems the planet TrES-2b reflects the light beam is less than 1 percent of its star. "Albedo is darker than the acrylic paint or coal. 's Strange," said Dr. Kipping told the BBC.